Yesterday there was a flurry of state announcements regarding transportation project funding, primarily from the SB 1 gas tax revenue. There are funds for numerous Southern California projects, including bus, rail, BRT, streets, highways, goods movement, and more. See below for a full listing of all funded projects in the Southern California region. Other than the transit capital grants, most of yesterday’s announcements were staff recommendations which need final approval from the state transportation commission (CTC) next month. Metro is reporting that the agency is slated to receive $1.792B in competitive SB 1 grants: 26% of the funds awarded statewide. The funding comes at an important time for several LA County projects that have significant funding from Measure R and/or Measure M sales tax dollars, but are not quite fully funded. California is stepping up at a time when federal transportation funding is favoring neither transit nor blue states. One important example is the Foothill Gold Line extension 2B from Glendora to Montclair. The $1.5B light rail project already broke ground, but still needed about $279M to be fully funded. The Gold Line extension received $300M from California; this keeps the project on track to award its primary design-build contract later this year. California is in a hurry to spend SB 1 monies expediently, because a Republican effort to repeal the gas tax is expected to qualify for the November ballot. The full list of Southern California projects is below, listed in the four separate funding categories. Note that projects are listed in alphabetical order by county. The six counties in the Southern California Association of Governments are included: Imperial, Los Angeles, Orange, Riverside, San Bernardino, and Ventura. $28.6M to Anaheim Transportation Network (ATN) – for 40 electric buses to double service levels on up to 8 routes, add 2 new routes and new circulator. 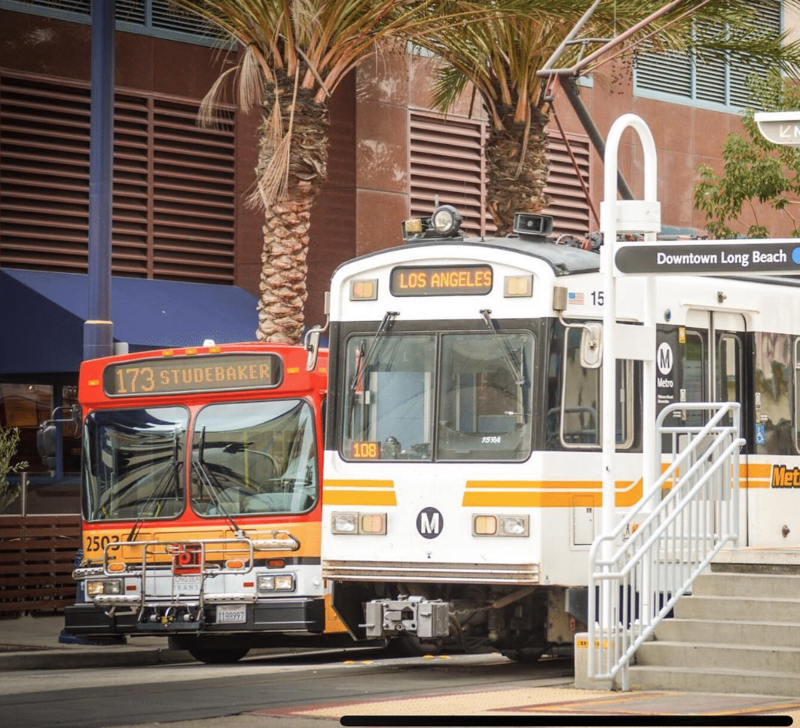 $13.2M to Antelope Valley Transit Authority (AVTA) and Long Beach Transit (LBT) – for 7 AVTA electric buses and charging infrastructure, and for 5 electric buses for LBT. AVTA to be fully electric by 2019. $36.1M to Los Angeles (LADOT) – for 112 electric buses to increase frequency of all existing DASH routes and add 4 new routes. $330.2M to Metro (plus $758.3M in later years) – for Foothill Gold Line extension to Montclair, East San Fernando Valley Transit Corridor, West Santa Ana Branch Light Rail, Green Line extension to Torrance, North Hollywood to Pasadena Bus Rapid Transit, Vermont Transit Corridor Project, and regional network integration with Metrolink, Amtrak, and additional transit services. $40.4M to Los Angeles San Diego-San Luis Obispo Rail Corridor Agency (LOSSAN) – for improving Amtrak Pacific Surfliner capacity including signal optimization, more robust capital maintenance, and new right of way fencing. service to Santa Barbara from five to six round trips, and to San Luis Obispo from two to three round trips. $30M to San Bernardino County Transportation Authority (SBCTA) – to develop a Zero Emission Multiple Unit (ZEMU) train set that would operate on the Redlands Passenger Rail Corridor, along with conversion of Diesel Multiple Unit (DMU) rail vehicles used in the Redlands Passenger Rail service. $763,7M to Metrolink (plus $112M in later years) – for Union Station run-through tracks and for 30-minute frequency service on multiple Metrolink corridors in the L.A. Basin.